This is a collection of 30 wordsearch puzzles and fill-in-the-blank activities designed to help in the development of spelling skills. 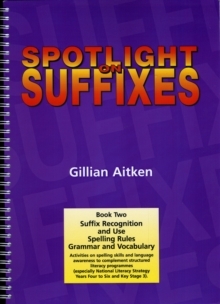 Each puzzle is based on a specific vowel or sound combination, so the book can be used by teachers as part of a structured approach to spelling and to concentrate learning activity where it is needed most. 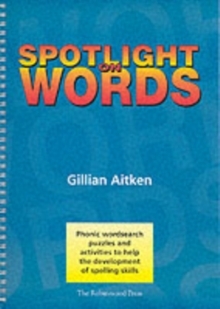 The skills developed by Spotlight on Words - Book 1 include: visual discrimination through searching for hidden words. alphabetic sequencing practice by listing the words found. following contextual clues through fill-in-the-blank exercises. use of a process of elimination by completing the more difficult blanks. use of the connection between spelling and meaning. development of the ability to spot capital letters. understanding word segmentation and syllable blending. The puzzles are most appropriate for ages 9 to 12 but they are also valuable over a wider age range, including adults and those learning English as a Second Language. 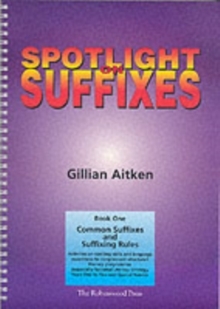 The clear design of the puzzles guides the reader's eye and the hidden words run only across or down, making this book an excellent resource for dyslexic students.The Spotlight Series is a complete set of worksheets and activities to improve spelling skills, reading accuracy, grammar and phonological awareness. The series explores blends, suffixes and phonics through uncluttered, enjoyable exercises that are both classroom and attention friendly. The puzzles and games have been tested to engage as well as teach. Each book is deliberately non-age specific, allowing simple differentiation from early structured programmes through to Key Stage 3 and on to Adult Learning. Although the books offer valuable assistance to those with speech and communication difficulties, the activities are an excellent mainstream resource to promote language skills. All the worksheets in the Spotlight Series titles are photocopiable within one educational establishment, and are spiral-bound for strength and ease-of-use. Guidelines for teachers are included, as well as answers, where appropriate, to the worksheets.